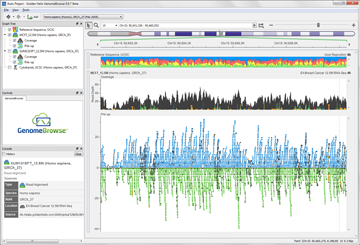 GenomeBrowse, a free visualization tool for all types of sequence data, was introduced in 2012 to broad acclaim. Researchers using GenomeBrowse discovered a product far beyond the status quo with seamless navigation of sequence alignments and other genomic data using a fluid, fast, and intuitive interface that just "made sense." Recent updates to GenomeBrowse, including support for VCF files and BED files and the ability to export tables of data extracted from viewable annotation tracks, further improved the product and created new synergy with Golden Helix SNP & Variation Suite (SVS). This webcast will demonstrate the ability of GenomeBrowse to stream sequence alignment data from the Amazon Cloud, seamlessly transitioning between whole genome views and base-pair resolution in the context of both public and custom annotation tracks. We will show how GenomeBrowse can be used in conjunction with SVS to highlight false variant calls, confirm the inheritance pattern of putative functional variants, and aid in the interpretation of a variant's impact. Examples of RNA-seq expression analysis, somatic variation in cancer, and family-based DNA-seq analysis will be included.